Want to get more from your company values? 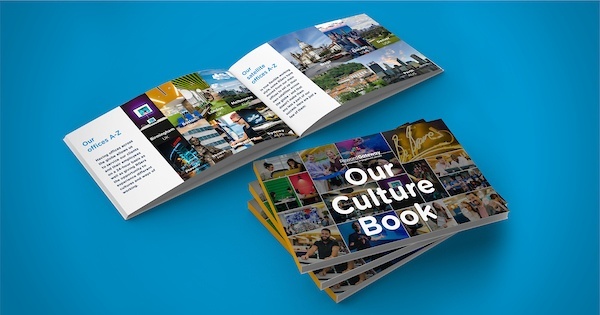 Download our Culture Book to see how we put our company values at the heart of our business and get ideas for how you can bring yours to life too. What good is company value if it's never even used? At Reward Gateway, we’ve put a lot of work into creating (and maintaining) our company values. Our values define who we are, what we produce and how we manage our days, projects and expectations. They're critical to employee engagement. But one of these eight values wasn’t getting enough attention lately. And it made me wonder, what could we do to fix it? The value in question was Speak Up. Remember it isn't just what we say but how we say it. Speaking up goes hand-in-hand with being self aware. What we’ve found though, is that even though this is one of our favorite values, not enough people are, actually, speaking up. We can even see it on our eCards platform — out of 1500+ cards sent every month from Reward Gateway employees to others, there wasn’t a single Speak Up card sent! So I started thinking, why aren’t people speaking up? What I learned was many people tend to stay in silence even if they know something is wrong. So as the new Internal Communications Assistant in charge of our internal communications platform alongside Cat (you know her as a frequent blogger here! ), I decided it was time to Speak Up myself and let people know that their voices weren’t being heard. I wrote an open letter to my coworkers with a few key learnings: Futility (pointlessness) has been found to be 1.8 times more common than fear as a reason for employees not speaking up to their managers. In other words, it’s not that we’re merely scared of giving feedback. 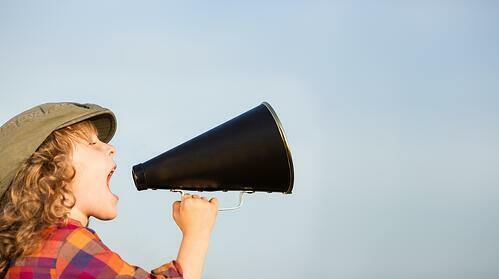 It’s that we don’t think anything will come of the feedback when we voice it. 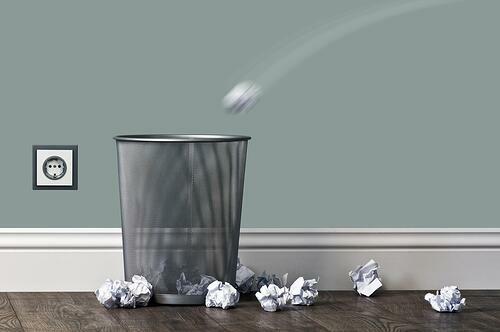 Futility, more than fear, is why employees choose not to speak up to their bosses. They don’t see what’s in it for them - in their mind they don’t make the link between getting support and actually being better off as a result. They think they will be seen as a trouble maker or attention seeker. They are worried that they will get someone else into trouble and they feel bad about that – as a general rule people don’t want other people to suffer as a result of their actions, even if it means suffering themselves instead. They are shy or nervous and would like to say something, but don’t have the confidence. They don’t feel like they deserve help – they don’t want to be a bother to other people and add to their workload. But we didn’t stop at just one plea. Because our boom! internal communications platform is always changing, we have a specific home for our Values pages, but we wanted to bring more attention to our specific value Speak Up. After all, what good is a value if it’s never used? 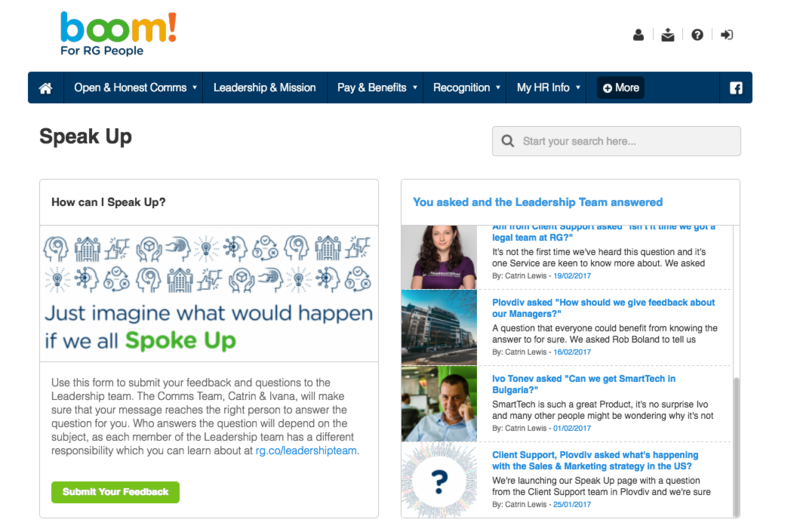 So we created our Speak Up page, as you can see, and since we launched it at the end of January, we’ve answered more than 10 questions from our people, and we have a backlog of questions for the Leadership Team to go through as the page grows. We’ve put an easy-to-use Google form on the page, with an archive of questions and answers in a blog-like format. We also have some FAQs for the curious, such as explaining why the form isn’t anonymous and typical turnaround time for questions. We also showcased one of our favourite Speak Up moments, when Cat Wright in our office asked why we weren’t leading the way with social change. (Read more about that moment over on our Diversity page.) Lastly, we chose Speak Up as our Value of the Month, and were able to talk about some great examples of even more Speak Up moments from our people. If you have an employee engagement platform, I encourage you to take advantage of the customizable features to better showcase your values and make it easier for people to live and breathe them. Tell us on Twitter, how are you bringing your values to life? Ivana Yalamova is an International Communications Assistant at Reward Gateway.